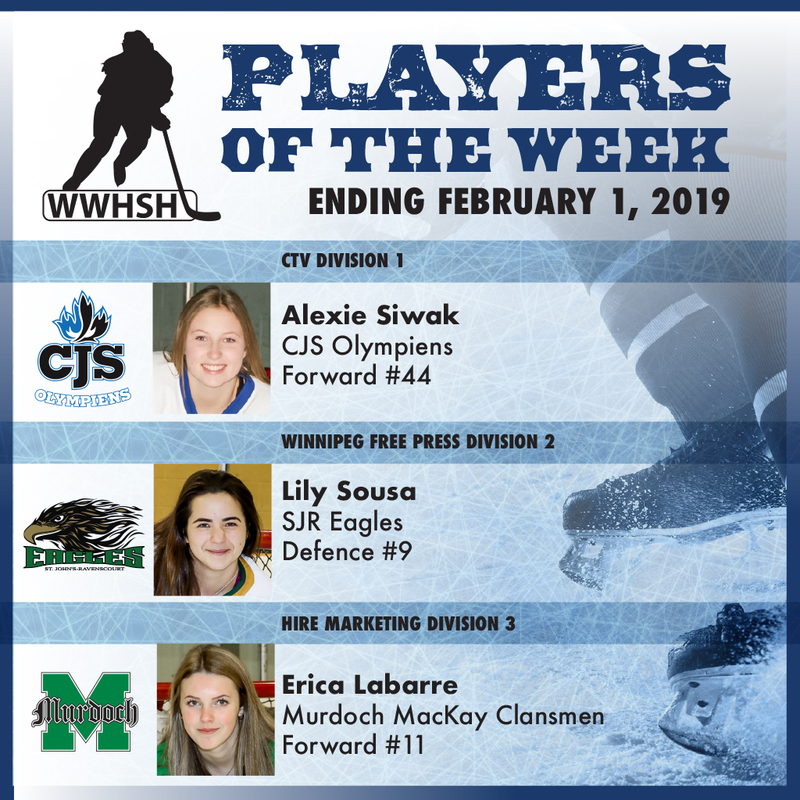 Congrats Players of the Week ending February 1! Alexie Siwak led the Olympiens to a convincing 11-1 win over the Oak Park Raiders on Thursday with 5 game points. Playing an extremely strong game, Alexie got on the score sheet each period, starting with 2 assists in the first period, 2 goals in the second, and completing an impressive game with another assist in the third. A leading scorer, Alexie has 23 points for the season. Congratulations Alexie! Lily helped the Eagles achieve a massive 6-5 comeback win against the River East Kodiaks this week. Down 4-0 late in the second period, Lily scored two goals in 10 seconds to complete a flurry of 3 Eagles goals in under a minute, pulling the Eagles within 1 goal of the Kodiaks going to intermission. Late in the third, Lily scored her second unassisted goal of the game to earn a hattrick. Amazing performance Lily! Erica started the week off with a hattrick, earning the final goal at the 0.7 second mark of the third period to secure a hard-fought 4-3 victory for the Clansmen over the CPET Canadiennes. Erica followed up her early week success with a fourth powerplay goal on Thursday. Congratulations Erica! *View more Players of the Week!